Union Station is the destination and departure point for over 90% of all GO Transit commuters and our nation’s busiest transportation hub. With more and more riders taking GO Trains to and from Union Station each year, we’re taking action to keep our customers safe on our platforms. On April 28, 2015, there was an accidental death on a GO Train platform at Union Station. Following this incident, Metrolinx reviewed all of its safety measures for managing passenger volume and movement on Union Station platforms. Metrolinx also explored improvements to existing measures and proposed new measures wherever possible, resulting in a set of recommendations that formed the Union Station Platform Action Plan. regularly studying passenger volumes and movement to reduce crowding and identify areas for improvement. GO Transit also monitors the effect of special events, delays, cancellations, and other platform changes to ensure the right measures are in place to move people safely and efficiently to and from Union Station. Examples of this include introducing extra standby trains during major sporting and entertainment events downtown, and carefully scheduling the arrival and departure of all train trips to provide passengers with enough time to get on and off the trains. increasing general safety awareness among passengers. Introduce no standing zones in areas where there is less than 50 inches of space between the platform edge and nearby structures, such as stairwells and elevators, and ensure these areas are identified with standard signage. Signage has been installed to indicate “No Standing Zones”. An enhanced “No Standing Zone” visual was painted on the platform surface in these areas in the spring of 2016. The existing signs were also replaced with this enhanced visual. In the spring of 2017, all “No Standing Zones” have been refreshed with an enhanced stencil, new signage and cross hatching. In 2018 a new standard will be developed for implementation; to include any “No Standing Zones” at line Stations. Subject to specific exceptions, prohibit storage of any kind on platforms. Construction materials and tools that are not in use and not required for employee safety are to be removed from platforms. Note: To balance safety concerns, certain exceptions will apply. For example salt storage will be reintroduced at either end of the platforms away from passenger circulation during winter months. Regular audits will generally coincide with the completion of construction phases and when seasonal equipment is introduced (or no longer required). In 2016, audits were conducted in February and September. Another audit will be conducted in the winter. During the most recent construction phase change, a joint walk-through of Union Station platforms took place to ensure materials and equipment were removed, cleanup was completed and overall state of readiness for passengers. In 2018 a new construction project begins in the Train Shed. Formal walk about has been held to ensure unnecessary materials and equipment, and stair towers are not located on platform surfaces. During fair weather, prop open doors to stairwells to enable better passenger flows to and from the concourse and teamways. This practice will be upheld and reintroduced each spring. All platform doors are propped open during peak periods, except during winter months. Maintain a standard, 24-inch wide yellow safety strip on all Union Station platform edges at all times, including periods of renovation and construction. provide a tactile warning to pedestrians. If a permanent safety strip that meets these criteria cannot be maintained due to construction or other factors, a painted yellow safety strip will be applied in the interim. As of July 2017, all platform edges have been inspected and repainted. As construction continues at Union Station, yellow strips are being refreshed as needed to meet the standard of 24 inches. Permanent tactile surfaces will be installed when construction in a given area is complete. consider specific points of congestion (e.g., no standing zones) when determining the extent of platform crowding. This practice has been put in place. The Metrolinx Design Requirements Manual has been updated and amended. Trim certain sections of select platforms within the Union Station train shed where steps overhang into the yellow safety strip area to eliminate potential tripping hazards for individuals who are not obeying the no standing zone or walking rules for those areas. All platform trimming has been completed. using a wider variety of communications channels to distribute the messaging to customers. highlight the risks of distracted walking, running on platforms, and forcing doors. A safety campaign and support messaging for frontline staff have been developed and deployed. The campaign supports various safety messages throughout the year using all available channels for customer communication. Safety messaging is repeatedly and consistently delivered to customers through PA announcements, posters, scrolling messages on display screens, and as part of the overall annual safety campaign. Increase safety enforcement through increased staff presence on platforms to monitor crowd behaviour and enforce safety. This includes educating people about which areas they cannot stand or walk on, encouraging passengers to be aware of their personal belongings and surroundings, limiting access to platforms depending on passenger volumes, and auditing/reporting any observed issues. Transit Safety Officers are on the platforms during all peak-period operating hours to provide increased enforcement and monitor customer flow. Officers create Incident Action Plans for all special events and Transit Safety Sergeants are now embedded in the GO Transit Control Centre, during evening peak periods and special events when there is high chance of overcrowding on platforms. Increased staff presence is also factored into safety campaigns outlined in the previous item. Adjust the location of mini platform ramps wherever possible to ensure doors do not open into no standing zones. Because each mini platform ramp needs to align with a set of doors, their location affects overall door alignment. The Union Station Enhancement Project will involve constructing wider platforms, increasing vertical accesses, adjusting locations of mini platforms and eliminating most (if not all) “No Standing Zones”. Upgrade the interior doors on older train cars to make them easier for passengers to open, enabling easier movement between cars and a more even distribution of passengers throughout the train and on platforms. A series of recommended modifications to rail cars is being implemented as fleet equipment is scheduled for refurbishment. Upgrade and improve CCTV and public announcement technology within the Union Station train shed to enable staff to better identify and respond to safety issues as they occur. Enhancements to the public announcement amplifiers were completed in spring 2016. The CCTV technology will be upgraded as part of the next major phase of construction within the Union Station train shed, which will begin in 2018. All PA’s have been upgraded and existing CCTV systems have been repaired. Further review of the effect of train delays, cancellations, and unscheduled platform changes to better understand how they impact passenger volumes and to determine the most effective responses to these situations. Consider additional crowd control strategies in holding areas and on platforms. Rail Operations and the Safety Management System Committee is actively reviewing existing practises and determining if best practices from other jurisdictions may be applied. More in-depth studies will be conducted through the development of the GO Regional Express Rail program. All special events and peak periods now include oversight by Transit Safety Officers and are supported by Action Plans. Explore the need for additional platform modifications and possible fleet design changes to address other equipment that overhangs into the yellow safety strip area, such as handrails. A series of recommended modifications to rail cars will be pursued. All recommendations have been consolidated into this document; action plans are either underway or complete. Study the feasibility of installing platform edge barriers in areas where there is less than 50 inches of space between the platform edge and nearby structures. An internal review of the feasibility of installing platform edge barriers was undertaken. It was found that installing barriers in these areas is not feasible due to curvature of platforms and the potential hazards that these structures could create. Study the feasibility of creating marked loading zones where customers can line up. It was determined that set lineups would introduce additional hazards. Wider platforms with better circulation and more passenger waiting space coupled with 15 minute service will be most beneficial. Work with Parks Canada to explore changes that can be made to the Union Station train shed in light of its designation as a National Historic Site. This would in turn allow improvements that address current and future safety issues resulting from increasing passenger volumes. Discussions are ongoing as new designs are introduced. Modifications will be designed and reviewed as restrictions are eased. increase awareness of platform edges through enhanced warnings when trains are entering or exiting the station. Research on alternative platform design is underway. 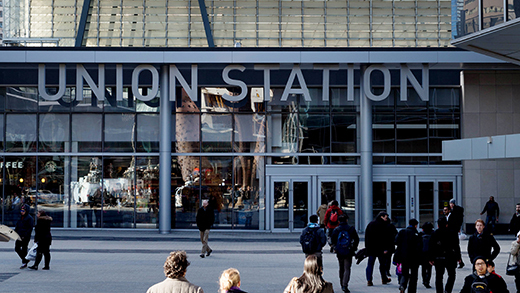 The preferred design will inform platform enhancements that are implemented as part of ongoing Union Station upgrades. A feasibility study was completed that suggested viable choices for platform edge warning technology. Staff will determine if this technology will be included as a requirement through the Union Station Enhancement Project.